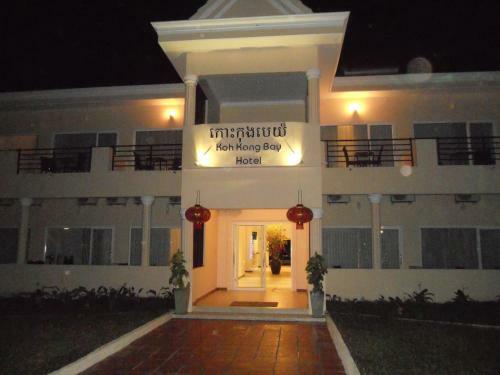 Koh Kong Bay Hotel | Low rates. No booking fees. At the mouth of the river Tatai offers the Koh Kong Bay hotel offers elegant rooms overlooking the river, the mountains or the tropical gardens. It has a salt water pool, massage facilities and a fitness center. Book a room at Koh Kong Bay Hotel online and save money. Best price guaranteed! Koh Kong Bay Hotel: low rates, no booking fees. The hotel is located at Prek Koh Por (200m left before the bridge) in Krŏng Kaôh Kŏng, Mondul Sema, Koh Kong, Cambodia – see Krŏng Kaôh Kŏng map ». Hotels in the neighbourhood of the Koh Kong Bay Hotel are sorted by the distance from this hotel. In the following list, large airports nearest to Koh Kong Bay Hotel are sorted by the approximate distance from the hotel to the airport. Airports near to Koh Kong Bay Hotel, not listed above. In the following list, car rental offices nearest to Koh Kong Bay Hotel are sorted by the approximate distance from the hotel. The following list shows places and landmarks nearest to Koh Kong Bay Hotel sorted by the distance from the hotel to the centre of the listed place.